Wow – these are really delicious! I made 9 two bite cookies. They didn’t crumble and were tasty! Oh my goodness! I’ve been eating low histamine for 3 weeks and was really craving something sweet! These cookies were really good! Chewy and sweet and just exactly what I was hoping for! I used palm shortening instead of butter, added some (abt 1 tbs)shredded coconut and coconut sugar(abt 1 tsp) and prob used a little more honey than it called for 😬. Let them cook until the edges got really brown and they were perfectly chewy! Made the recipe exactly and before I put it in the oven I knew it would be dry and crumble. I added an extra table spoon of butter and added some maple syrup because I ran out. It still crumbled the moment I touched them and was still dry but pretty tast stillKudos for coming up with this. I was wondering if you could use coconut butter in place of dairy butter in your recipe? You can use coconut oil, but not coconut butter. Just so you know, butter is not a superfood. I don’t know how any sane person can claim that. In fact, it’s one of the foods you should avoid the most. Honey as well. We don’t need either of those things in our diet, especially considering milk and honey are not ours to take. Judging from the mixed reviews and the fact that you said butter is a superfood, I’m going to skip on making these cookies. Please check your facts next time. We already have enough misinformation out there, thank you. Again apologies for this long thing but on such a happy site it seems a pity to have such a negative response to a recipe shared very kindly by coconut mama. Omg will y’all just shush up and bake! I appreciate that you took the time to lovingly correct Brittany´s error! I just found this recipe at 8pm, looking for something sweet, easy and mostly healthy. By 8:30 I had tasty little cookies cooling on my counter. They were delightful! A little crumbly, but if you eat them in one bite instead of 2 that solves that problem. Aaaand I don’t even care about remainder crumblies-I just folded the napkin and funneled them into my mouth, another problem solved! I doubled the recipe and made 10 cookies, and I’m only partly ashamed to say that we at them all. Thank you so much for this easy and tasty recipe, I can’t wait to try adding spices and such!! That is nothing but mind control and propaganda. Whole milk, raw butter and all of that is very healthy. Margarine kills. Aren’t you a ray of sunshine! I think butter is SUPER 😋. Did you really need to be so rude? How about you wind your neck in and just scroll on? Subbed fiberyum syrup for the honey and added a touch of vanilla and maple extract, 15 drops of stevia glycerite then sprinkled a cinnamon/erythritol mix on top. Taste was good but 9 mins was too long for the fiberyum, turns items crisp, but the cookie was great that way too. I’m sure honey wouldn’t turn crisp, I’ve made these cookies a few times without the fiberyum and they were always good. I just felt like trying something different. I’m going to keep making these because they’re easy, fast, and fun to tweak. I just made these. Other than 8 cookies being a stretch (I made 6 and they were very small), they are very good! I am low on butter, or else I would have doubled the recipe for sure. Will make again! Thank you! I made these today. I substituted maple syrup for honey. The cookies stayed in their ball shape. When I ate one I nearly choked because they were so dry. Is that because I used maple syrup rather than raw honey? These turned out looking like little biscuits, but tasting like sweet little cookies. They were the perfect little treat for my sweet tooth! Next time I make this recipe, I am going to have to mix up a little chocolate (1 TBSP cocoa powder, 1 TBSP butter/coconut oil, and 1/2 TBSP honey) to smear on the top! I also made it into 4 cookies. They turned out great the 2nd try, but the 1st time I made them with old coconut flour so that doesn’t count anyway! I used melted butter and maple syrup- yum! I’ve also added vanilla and want to try with cinnamon too. As long as you let them cool before touching them , they won’t crumble and be nice and crispy outside and soft inside. I love your recipe however I can’t have honey can I use stevia and coconut butter? Thank you so much Tiffany !!! I’m a Coconut Nana. Bless You !!!! Hi i made them the first time and cooked them too long so i tried them again. I added coco to it and i had pumpkin spice date rolls and put pieces in the middle . They turned out moist . I will try more types of fillings as i go . I made these cookies but I used all-purpose gluten-free flour. I also used coconut oil rather than butter since our grand daughter is gluten-free and dairy-free. I didn’t use parchment paper since I don’t have any and I mixed them by hand. Since someone said hers burned I set my oven at 350 rather than 365 and kept them in for 8 minutes. The coconut oil ran out all over the cookie sheet but the cookies look good and taste good. These cookies are also driest cookies I’ve ever eaten! I added a tad more butter and more honey and they’re still dry as the desert! It’s like eating get chalk with honey. And if you think I’m lieing try these cookies yourself then choke on theread dryness just as I have! I would give this negative stars if I could???? I agree! I am laughing so hard at my kids faces as they try these cookies! I totally would have won the worlds funnest videos! Although we did not enjoy this one, Thank you Coconut mama for trying to come up with an easy healthy recipe. I made this and there’s barely any dough. I seriously was laughing that someone could make 8 cookies out of this! Unless you want fairy sized cookies then the most you could get is 4! Did I do something wrong? Are these measurements wrong!? YUMMY! I added an 1/8 teaspoon vanilla extract. I first made the recipe with cold butter. Great dough. I then tried it with coconut oil. If you use coconut oil, it should be solidified or cold. Mine was room temperature which equals melted and made the dough runny. I have the dough in the fridge now I think it will work after it cools. THESE ARE UNREALLLLLLLLL! So good and super guilt free! I adddd a dash of the salt and a dash of vanilla extract! Absolutely worth keeping the recepie! Btw if your a chewy cookie fan these will be your favourite too! Last step is very important though! Let them cool! Only recomdation I have is I would change your serving portion to one cuz hubby isn’t getting none ???????????????? Can I subatute any other oil in place of butter in this recipe? Also I saw in a recipe you have homemade choc. Chips . But I couldn’t find the recipe. Hi everyone. Wondering what I did wrong? Followed the recipe exactly. The dough was perfect and taste was amazing. However, after I cooked them they crumbled. I really really want these to work because my kids have so many allergies! How many calories for serving? Thanks for tbe recipe. Do you think i can substitute the butter for coconut oil? YES You can I did! Finally I found an eggless cookie recipe! I used molasses instead of honey (what I have on hand), and coconut oil stead butter, and a few drops of organic lemon oil and they are yummy! I can’t wait to try them with honey! Thank you!???? The first time I made these, I followed the recipe exactly as written. They were tasty, but they were pretty dry and hard to swallow. I made them again, but added vanilla almond milk and vanilla extract. They were so yummy!!! Still a bit dry, but much better. I kind of expected them to be dry since it was coconut flour and no eggs. But they were so easy to make and so good!! I love how simple these are. They remind me of a sugar cookie. Was just craving a treat and made these with coconut oil in place of butter (saving my ghee for breakfast! ), rose petal infused honey, & a touch of almond extract. Light & lovely! Slightly chewy (not crumbly) when left to cool. They do have that mouth-drying coconut flour vibe about them — I wonder about adding a flax egg or replacing one tablespoon with rice flour or something that incorporates more easily… though I prefer them this quick & easy way! Gratitude to you for sharing. I made this egg free cookies but they don’t bond. They crumble why? I did the exact recipy and had 11 small cookies. I cooled them and ate, delicious and yummyyyy. On the other hand, i calculated the gram of sugar per serving and its 11.5 grams of sugar. 1 teaspoon of honey has 5g sugar and 2 tablespoon has 1g of sugar and coconut oil has no sugar, therefore the total recipy has 11.5g of sugar which is great. Thanks again for sharing. I’m going to make them tomorrow morning! How much coconut oil do I use instead of butter? And should it be melted or not? Excellent! The cookies turned out great, and we will definitely make them again. So easy too! Thank you for sharing this recipe! Excellent! The cookies turned out great! Thank you for sharing this recipe! 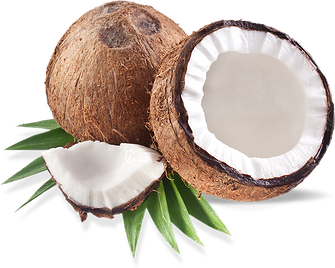 Would you use Coconut Extract in your baking ? My sister suffers from ms and this is a great snack i like to make her once in a while. She loves them! I think it’s because, as it says, it’s only a batch to serve 2. 🙂 Even with a larger batch, most coconut flour recipes will have small amounts of the flour because it absorbs moisture majorly. A little goes a long way. Still, this recipe is meant to serve 2, and that’s why this one is so small. Does seem strange, though, since people usually like to make at least a couple dozen cookies at a time. Be very careful not to over brown these guys because it does change the flavor a little. If your looking for a simple semi sweet, almost bland cookie- these are perfect! To make them a little sweeter, I would suggest perhaps a pinch of powdered sugar on top, or even an added two tablespoons of coconut sugar, honey, or whatever sweetener your using. I enjoy dipping them in some warm honey and eating them with tea as a light snack. This sounds great! Have you ever tried it with vegan butter like the earth balance pads? I love how these just make a few cookies for a quick, easy treat and only have three ingredients. I bet they taste like a sugar cookie and I bet they would be good with ghee if you like a stronger butter flavor and/or don’t do butter. I’m pinning it now to try later. I just made these and they are delish! I quadrupled the recipe to yield 20 cookies. 3/4 cup coconut flour, 1 stick(1/2 cup) of butter- cut up, 3 T honey, and I added a drop of almond emulsion for flavoring. Blend all in a food processor til a ball forms. Scoop out with a 1″ cookie scoop onto a silpat lined (or well greased) cookie sheet. 3 Tbsp. Coconut Flour ? for how many cookies? I followed the recipe exactly but the cookies were so dry that even my husband couldn’t eat them and he will usually eat anything! I covered mine with chocolate syrup and managed to get them down but had to have a lot to drink with them. So disappointed! I used coconut oil and coconut sugar with homemade coconu flour..and they melted absulutely – like liquid. What could go wrong? I’m typically a Cheer leader, but I found this recipe very disappointing 🙁 the cookies were the size of a quarter, one bite and too condensed. Should we have flattened them more ? Is it truly worth heating up the oven for eight little nuggets ? Yes, as I mentioned in the recipe these are small 2 bit size cookies. If you make them bigger they fall apart. You could double or triple the recipe if you’d like to have more cookies. Hi. Just wondering if the butter can be substituted for coconut oil. these cookies look fab. is there a vegan version using coconut oil instead of butted? Made these today and they are so yummy, I ate them all right away! I made them with coconut oil and raw creamed honey. Only made 7 very tiny cookies and took 4-5 minutes in the oven. Tried these tonight, I’m also very pregnant and wanted an easy sweet to bake! Tastes yummy but quite dry and crumbled when you pick one up. Make this afternoon. I used coconut oil, skipped the butter. They were wonderful!!!! Do you have any nutritional facts to go along with this? I had a stroke 2 months ago and my diet is restricted to no to low sodium, low fat, low cholesterol. Eggs are definitely out. I was also told that coconut oil is high in fat. Yes it’s healthier fat but fat nonetheless. Nutritional values are what I live by nowadays. Can you help? You enter food information and it calculates the nutritional values of food, drinks, recipes and ingredients. I made these with the butter and also added some chia seeds! Thanks for the recipe! I was wondering, I made these coconut cookies, and let me tell you, I’m a Paleo with a peanut & tree nut allergy, so these were by far the best and easiest cookies I’ve ever made that turned out GREAT!!! I was curious, can I substitute some of the coconut oil/butter with an egg? What do you recommend? I love all the recipes, but am concerned that there is no nutritional information. I am on a LCHF diet and wondered what the carb count is for these delicious cookies. Love all of your recipes and ideas. I would like to ask you a question, can you exchange coconut oil in a recipe that calls for vegetable oil? 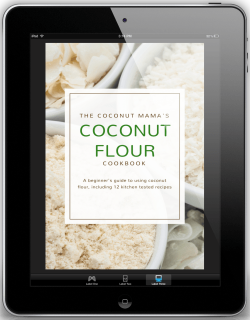 3 tablespoons of coconut flour…wow, huge loss. Can’t wait to hear how you came up with a better recipe. What can I substitute for the raw honey? What can you use in place of honey if you’re on a Candida diet? Stevia? I just made these with coconut oil, doubled the recipe and added vegan chocolate mini chips! Very yummy! I made them for my niece who is on the GAPS and is GF, CS, and dairy free. Tried substituting coconut oil for butter, and the cookies turned into puddles in the oven! Any idea why? How could I substitute honey for xylitol or sugar or something dry? I’ll need to test it for exact ratios. I think you’d need to add some applesauce to them so they don’t turn out dry. Thank you I love these I just made them! Changed up the recipe a little – doubled ingredients except added one tbsp of raw organic cacao powder in exchange for one of the tbsp’s of coconut flour! Omg so good! Also used coconut oil — and I forgot the dang salt. Still delicious. So easy, perfect for a kitchen novice like me! Terrible, sorry! I tried these 6 different ways tonight and they were terrible each and every time and yes, I am used to eating very clean with a detoxed palate. What a let down and waste of time. 1st batch was as written but with coconut oil, egg and honey, 2nd was coconut oil and maple syrup, 3rd was coconut oil, egg, lemon and lemon zest and 4th was coconut oil, egg and vanilla extract. 5th was coconut oil, egg, honey and added chocolate chips. 6th and final batch was coconut oil, maple syrup and cinnamon. Who knows if using butter instead of the coconut oil would have helped? All I can say is the 6 ways I tried above did NOT work out. The cookies did look just like the photo above (if you press them down very thin, the recipe says lightly but in order to get that thin look in the picture you need to press down hard and thin), however it only makes 4 cookies, not 8. They were just so dry and chalky, both with the egg or without. And no flavor, even with all the included items I used above! These are just fabulous! And the possibilities are endless… I only added some vanilla but you could add many things to these such as cinnamon, cocoa powder, PB Fit…. the list could go on and on. Yum! Oh one other thing I only made 2 cookies from this recipe because anything smaller would just be too small ? Perhaps it didn’t work for you because you added eggs. There are no eggs in her recipe! I just made these. Followed directions plus added a tiny vanilla extract. I made 5 cookies – cooked 9 minutes at 370 (my oven is stupid.) After they cooled I put some jam on top. They were delish! Hi Chef, I tried your recipe and it dint turn out good. Cookies fall apart. I used coconut flour, amul butter which was cold (from Indian store, though I have coconut oil from trader joes but I was not sure about temp) and honey. I pre heated the oven at 365degree and baked for 8 min as they were turning black kind from bottom. When i got them out they fall apart and I could not shift them into cooling rack. Please guide as I really want this recipe to turn out good. I doubled the amount and added chocolate chips. We (mainly me) eat a very low carb diet. But I like to make bread and the wife cookies. So trying these out. Thank you for the recipe! Can’t wait to try it. I have a craving for Chicago Public School cookies which ingredients are flour, sugar and butter. Alias, I wanted a healthier version. Again, thank you! Delicious! I heard about these from a friend, and came to see where she found them. Totally going to reblog! After my first try replacing butter with coconut oil, which didn’t taste good, though I added vanilla, cinnamon and cardamom, I tried them today again with butter and adding some grated lemon zest and it tasted great! Thank you for this simple recipe, Lauren! Last night I had to bake cookies for my daughter’s class, and the recipe I used originally turned out terrible, so I was frantically thinking of what to do. I looked through your site, since I’ve had good luck with your bread recipe, and found these cookies. They were quick and easy to make (I increased the contents by a factor of 6) and the cookies turned out great. The only problem I had was that for some reason they were slightly burnt just after 5 min. I was able to use my grater to get rid of the burnt dough and they were yummy and presentable. My daughter was happy. Many thanks! Am I the only one that made terrible cookies? They were so dry, I almost choked. The second batch I cooked for less time and they are not as dry but still quite inedible. Could my coconut flour be too flour-like? I just tried these and thought they were great for simplicity and very quick – didn’t taste too bad either but a little dry for my taste. I added a splash of vanilla extract and a little bit of cinnamon. I tried one fresh out of the oven, warm and it crumbled. So, I let the remaining 7 cookies cool to room temp and they stayed solid – no crumbles. I sifted my coconut flour just because I read that it helps not to clump. Next time I’ll try adding an egg to see if the cookies are less dry. I can’t wait to try these! Do you think I could substitute coconut nectar for the raw honey? These were SO good! I made them the other night…they were done in about 6 minutes or less, lol. I could only get 6 small balls out of the mix. They were really good regardless, but any tips on how to shape them? I didn’t use a food processor – I just mixed the “dough” by hand and plopped it on the parchment paper with a spoon. Should I have used my hands to roll the dough into balls and flatten them? Either way – SO GOOD! I made them exactly by the recipe ingredients and amounts. I forgot where the parchment paper was so spent a couple of minutes looking for them. I put the batter ball in the the freezer for a few minutes while I measured and cut the parchment paper. Then I took the out and followed the recipe the rest of the way. They made 8 quarter size cookies and I really liked them so much! My oven runs a bit hot, I think, so maybe 8 minutes next time, but these were totally staying together. As a vegetarian, I am so excited to be able to make small amounts for myself!! I also think these along with the coconut flatbread rock! These are egg free( allergic to eggs) and in the coconut flatbread I substituted arrowroot and water in equal parts ( 1 tsp. each) and added a dash of coconut milk in placed of the egg. I let it set a few minutes and mixed it in that recipe. It was wonderful too and even held up as a sandwich with avocados, salt and pepper and garlic and lettuce. My heart felt thanks again!!! So I JUST made these and they were amazing. I used coconut sugar instead of honey. I also added in a bit of lemon juice. I didn’t wait for them to completely cool and they didn’t fall apart. They tasted like little lemon sugar cookies but buttery- delicious. My aunt loved them as well. Next time I’ll make 2 batches haha. Thanks for the easy recipe! Note: I didn’t use a food processor. I played with the butter in a bowl until it was soft then added in the palm sugar. I continued to “mash” that around until all the sugar was in the butter then I added the coconut flour and did some more “mashing”. After, I added in the lemon juice and “mashed” it around until everything was nice and mixed/absorbed. I made small balls and then flattened them out a lot (patience here as they can/will stick to whatever you flatten them out with). I baked them for 9 min exactly and they ended up a little toasted underneath. I think that made them better- sorta light crunch but melty. Yummmy! Could this be used as a sugar cookie recipe, would it work with cookie cutters? Just want to let you know that after 10 years of battling ibs, etc., my doctor ordered blood testing of food. After being on no dairy or gluten for 10 years, we found I was allergic to oats and yeast. Since I haven’t eaten those, I have no pain, or anything of ibs and all the problems! Ps- I love coconut too! For a more cracker-like treat is it possible to completely leave out the honey? I made these and while they were yummy, they were SO crumbly, I couldn’t even pick them up, the just fell apart. Any suggestions? Did you let them cool first? They’re very crumbly until they cool. I added an egg and a bit of almond flavoring and they turned our great. Really delicious!! Thanks for the recipe. I made these two and wondered if adding an egg would make them a little more moist. Did the egg change it at all? I made these cookies with coconut oil instead of butter, and maple syrup instead of honey (I’m vegan). While they were baking, I peeled and thinly sliced an apple and sauteed it with about a 1 Tbsp of maple syrup and 1 Tbsp water. I have been DYING to find a healthy apple crisp recipe and now I have it! Put the cooked apples in a bowl and crumble the cookies on top… Divine! Thanks so much for the cookie recipe. They are wonderful! But for the record, although they were VERY delicate and I had to be super-careful to eat them without them crumbling apart, the first batch actually was edible. ROTFL. My printer is out of ink, so I’ve been walking back and forth to the kitchen to get the instructions to make these. My cookies are SUPER-soft. I came back to check on what I did wrong and realized I flip-flopped the butter and flour. Oops. Talk about tender cookies! I just tried these with the following changes: instead of butter, I used ghee; instead of honey, I used 2 mashed dates. The yield was 6 small cookies instead of 8. I did not flatten them down as much as these, so they were softer in the center and crispy on the edges. They were neither too crumby nor dry; a perfect accompaniment to a cup of tea. just made these, OMG yummy! OMG these cookies came out just awesome! Thanks a bunch: recipe works exactly as it should. The most important point is to let them cool so they don’t crumble. These cookies are soooo good, they taste like shortbread! I used cold coconut oil in place of butter and just mashed everything together with a fork (like making pie crust). I actually made half the number of cookies and made them thicker. I let them cool in the fridge before eating. They’re so easy and yummy, it’s dangerous haha! Used the right measurements, waited for it cool, and it was still really dry. I read that M.I.L comment to my friend while he took a bit and thought the same as well=dry and almost died. lol . My cookies turned out dry. Any suggests as to why? I loved the delicate, sweet flavor and interesting texture of these cookies. I followed other commenters’ advice – doubled the recipe, added and egg and added a tiny bit of vanilla extract and also lemon extract. Delicious with green tea! Hi, have you ever thought to add lemon zest to these to give them a zing? Do you think it would work? Why haven’t I seen this earlier? Totally making this in the AM for my little who can’t have nuts or eggs. Awesome! Thanks a bunch. Hi there! I’m feeling a bit hungry today and do not have much appropriate snacking items in the house, so I looked for an easy gluten-free cookie recipe and came across this post. I didn’t have Coconut Flour, but I had Brown Rice Flour and threw the other ingredients together with that. So far the raw dough tastes yummy. I’m waiting for the oven to heat up so I can bake the cookies. Oh, and I add a few drops of vanilla extract. UGH- I was so disappointed with these cookies,they were so dry and crumbly. I thought my poor old mother in law was choking to death- You better have a cup of coffee, tea milk handy to chase the crumbs down. Yum! I followed your recipe, made sure to let them cool completely as you directed, and they are great! Shortbread cookies were always my favorite, and these definitely brought back that flavor. I eye-balled it and ended up with 7 2-bite-sized cookies but certainly could have pinched a little off each and made 8. Thanks for the solid recipe Lauren! These cookies are AMAZING! I doubled the recipe, used room-temperature ghee instead of butter, and added a tablespoon of carob powder. Delicious. Just made these and made some adjustments- I doubled the recipe, added one egg and about 1 tsp vanilla extract. They turned out yummy! The only problem is that I doubled the recipe and got just 9 cookies out of it. Don’t know how you got 8 from the original amount, but okay! Thanks for the recipe! I’ve made these a few times and they were a total hit! The first time i made them they crumbled, but I doubled the recipe and added a egg. They are Awesome!!!!! I used my dairy-free butter, which is half coconut oil and half evoo gently melted together, poured into the stainless steel mixer bowl and put into the fridge to start solidifying. Then I whip it good with the mixer and store in the fridge. I’m having a hard time making these. They taste divine, but I followed the instructions exactly and they never flattened out. I had crumbly cookie balls instead of beautiful cookies. Any idea why this may have happened? Do I need more butter or something? It’s better to use unrefined cane sugar than honey as honey becomes toxic once heated above 110 degrees. These are the easiest cookies I have ever made …… and I’ve been baking cookies for over 55 years. I pressed too slightly though and mine weren’t as thin as yours. Next time I think I’ll add some cinnamon or another spice to kick them up a bit. This is a recipe you can have a lot of fun with! I did get exactly 8 … 2-bite cookies. Thanks for sharing Lauren. ! I just don’t get it. There is no way this makes “eight two-bite-sized cookies” unless you are a mouse. I followed the directions exactly. These are terrible, dry, brittle and overall kinda gross. I made these the other week and they were tasty! Definitely on the dry side, but perfect with cream cheese! I am confused, though, how everybody got 8 cookies out of the original recipe. I doubled it and barely made 9 two-bite-size cookies! The ratio seems alright, just not the quantity. too dry, and sorry the pic. is soooooo big!!!!!!!!!!!!!! I tried these with coconut oil in place of the butter and came out with decent cookies, but had a hell of a time getting the ingredients to blend, even with using a food processor. (And still had oil sitting in the bottom of my bowl that just wouldn’t stay in the batter.) My cookies came out a little dry and chewy. Still good, especially dunked in tea or other liquid, but a little disappointing overall. Now that I’m re-reading the recipe and see that the butter is supposed to be cold, I’m thinking my issue might have been that my oil was room temp and liquid. The next time I make these, I’ll try chilling the coconut oil before mixing it with the other ingredients. I know this is an older thread but I wanted to say THANK YOU for this awesome recipe! These totally have that shortbread flavor which I love. I made four different batches. Plain (the exact recipe), Strawberry (with a little GAPS-friendly strawberry jam in the middle), Chocolate (just added a bit of cocoa powder), and Lemon (added lemon zest). All of these turned out moist, buttery, and delicious! My children were in heaven. Thanks for the recipe…I come from a culture that does not believe in eating bite-sized so I tripled the recipe and got 7 regular sized cookies. I also used coconut oil instead of butter, along with a handful of flax seeds, a teaspoon of almond butter, and a tlbs of mango syrup as my raw honey was coming to an end…Taste awesome! really melts in your mouth while warm…just took them out of the oven! YUMMY! Absolutely HEAVENLY! Perfect, just as the recipe stated! The edges have an indescribable pleasingly-chewy, caramel-like flavor… amazing! Thanks! I did use coconut oil in place of butter so I don’t know if that should have changed baking temp or time. crumble; but I couldn’t wait to taste them). Is there a way to make these diabetic friendly as well?? I have type one diabetes and a wheat allergy and I’d love to try these with out having my blood sugars go out of control. Maybe subbing brown rice syrup for the honey? I know that metabolizes differently than honey. I subbed coconut oil for butter, doubled the recipe (lots of people at my house. I have to share 🙂 and added the zest of one lemon. Seven minutes at 350. Yum! I’m off to try out this recipe but wanted to mention I think the reason people are commenting the cookies are crumbling is because you say in the recipe to enjoy them warm right out of the oven. In your replies to some of the comments you say to let them cool completely at room temperature before eating which will make them less crumbly. Those two things are conflicting and maybe if you were to change the instructions people would have better results. Just thought I’d share, I can’t wait to try them. Thanks! Great recipe, but a question, if I’m cooking them, why use raw honey? Am I wrong to think that all the ‘goodness’ of raw honey cooks out? Heating honey creates toxins so maybe use another sweetener. I believe heated honey is only toxic to bees due to the release of a certain chemical (cant remember), which is also found in molasses in even higher amounts. These are so yummy, thanks! I just made these and it only made 8 quarter size cookies. Is this correct, just 3 Tbls. coconut flour? We loved the cookie but they were dry so I’ll make adjustments next time. I made these vegan using coconut oil instead of butter and 1 ‘flax egg’ + a drop vanilla paste for flavour.. yummy! I just made these with coconut oil instead of butter and also added a flax seed “egg” turned out really good!! Thank you! coconut flour is low glycemic correct? Would you suggest subbing coconut flour to those allergic to dairy? Are you wanting to sub butter for coconut oil? I tried these and didn’t care for them. They fell apart and it was more like eating the flour raw. I felt it was a waste of butter. I’m sorry you didn’t like them. Did you let them cool? They shouldn’t fall apart after you let them cool. WWould these work with a vegan spread? My sister in law has some major tiny issues and allergies, as well as being a pescatarian. She cannot eat wheat, gluten, or dairy, among other things…but those are her worst culprits. She has been searching for baked goods to try….this looks like it might work for her, as long as dairy free spread wouldn’t harm the outcome too much. Have you seen how they make those vegan spreads and the ingredients? they look very unhealthy to me. why not use coconut oil instead of butter? that’s exceedingly healthy and vegan. What can I use instead of the honey? can you substitute ghee for the butter? I have no idea why you’d want to use ghee. I grew up using ghee, but ghee is not a substitute for butter; it does not taste the same. Ghee is used to “oil” cooking implements & used in making a variety of flatbreads in traditional Indian cuisine but it does not work well (or taste well) in traditional baking. I have noticed that since it became somewhat known in the west many people have talked about using it as a butter substitute, most often directly on top of bread, etc. but dislike the taste – because it wasn’t meant to be used that way. I will try this recipe w/coconut oil, as I don’t use dairy. I don’t understand the harsh tone of this post, but I thought I’d respond for future potentially interested readers. Some people use ghee (with varying success) where recipes call for butter because they may be sensitive to the sugars or proteins in butter, which are removed when ghee is produced. So, theoretically, one can use a dairy fat with some butter flavor without the irritants by using ghee. Some people are allergic to casein (dairy protein in butter) but can handle the fat when the proteins are removed (ghee) and so use ghee in some recipes to get some of the “butter essence” without the proteins. I use it part/part with coconut oil. Coconut oil and maple syrup together also creates a “buttery” type taste. Thanks for asking about the ghee. I am looking for recipes for a two year old just starting the GAPS diet due to hives after a year of antibiotics for kidney infections (long story), and ghee is allowed…butter is not. I appreciate the person that suggested half coconut oil with syrup options. We can use coconut oil…have to check on the syrup. no need for a food processor – use a fork and mash-up in a shallow bowl, works like a charm. These were amazing..I did a few with a sprinkle of cinnamon! Yay so happy to have a cookie for my son!! i just made these and they were a total fail for me. I am a terrible baker but figured with 3 ingredients i would be ok. they came out very dry and crumbly for me too. don’t know what i did wrong. Did you let them cool completely? They will cruble if you don’t let them cool. One has to let them cool down to room temperature after baking. Hi! I just tried these, and though I used coconut oil instead of butter and an appropriate granulated sweetener sub, they completely fell apart after baking :-(. Any ideas why? They are yummy though. Just won’t hold together. Adrienne @ Whole New Mom » Hi Adrienne! Hmmm. Did you let the cookies cool? They will fall apart if they don’t cool completely. These were really good. I love the few ingredients. Made them first subbing maple syrup for the honey (I was out of honey). The next batch I doubled, I subbed xylitol for honey and added 1 egg and 1 teaspoon of almond extract- these were by far the family favorite better texture and more flavor. Will definitely be making these again and again! Thanks for the recipe! We are vegan and don’t use butter. Can we use coconut oil instead? I made them as is (just doubled the batch), and they turned out pretty darn good, but a bit dry. I made them again by doubling the batch and adding an egg, a quarter cup of walnuts, and anise extract. The egg seemed to make them hold a bit better and have a bit more moisture. Love the recipe as it’s good on its own or as a base to tailor to your liking. These were soooo yummy. Thanks for sharing this easy delicious recipe! Hi, I just made them with coconut oil instead butter – delicious, but a bit too sweet for me. I don’t use sugar at all, maybe that’s why. Thank you ! My cookies are about the size of a quarter. Is this the right size? They’re a minute away from being done, and they smell amazing. Thanks to folks for the tip about letting them cool before eating them. Yummy! I checked this out because the flatbread recipe worked so well. In this case I did not have butter, so I pinched in cold Digestive Ghee. Made about 6 cookies that were quite delicate but lovely. I may make some adjustments again for my pantry but WOW I feel like I am starting to get the feel of coconut flour – I mean how to work with it. I mentioned this in a comment on the flatbread but Thank You. I truly appreciate recipes with smaller yields. Then if I mess up or it is not for me I am not pitching out 10 funky whatevers. Hi Mary! I’m sorry your cookies crumbled. Mine did that as well until I let them cool completely. Once you let the cool they do not fall apart :). Hi I just made these and doubled the recipe and still ended up with 8 small cookies that were a crumbly mess upon taking them out of the oven…nothing like your picture. Any suggestions? I followed the recipe to a t, but doubled it. Thanks! This looks like an awesome recipe but I’m confused about the raw honey. I’ve always thought that if raw honey is heated, all the beneficial properties are killed, so you might as well use sugar for cooking. But lately I’ve seen so many wonderful healthy cooks (like yourself) posting recipes that call for honey in baked or cooked foods, so I’m wondering if this information is wrong? I usually substitute maple syrup or succanat instead, but sometimes the recipes don’t hold together as well. What are your thoughts? Unfortunately, according to Ayurvedic tradition, when honey is heated over 300 degrees it becomes toxic (ama) to the body. I wonder about rehydrating a couple dates and making a date paste to use instead–may be sweet enough. Or would it work to cook at a lower temperature (like 275) for longer time? I will try this some day, but until then I guess I will wait until I am off the GAPS diet and will try this delicious-looking recipe with maple syrup. So glad to hear I can make these with coconut oil- I’ve had to cut out dairy, eggs and beef due to my 8 week old’s sensitivities to them in my breast milk. Drooling at the thought of making them tomorrow. Thank you! I’m the same. Really simple to make and tasty but I want to put in my childs lunchbox and they are way to crumbly for that. I can’t even pick them up. Any suggestions to make them ‘hold’ better? Ok I made them exactly as the recipe states. They were yummy and pretty but crumpled very easely, almost impossible to pick up. We ate the crumbs anyway. Thanks for the recipe. I am going to play with it for a bit. I tried with ghee (clarified butter) since I can’t tolerate casein. cannot wait to make these for breakfast! By accident I used coconut oil instead of butter (habit, I guess) and they turned out beautifully! Hiya – could you please let me know how much coconut oil you used in this recipe? I am very excited to find out how you made this simple cookie recipe work well while substituting the coconut oil in place of the butter! (as I read above that someone already tried it out with ghee and the cookies didnt hold together). I’m going to try these this afternoon. The amount of eggs used in coconut flour recipes often puts me off as organic eggs are expensive in the UK. I can’t wait to see how these turn out. These look great! I was wondering if you think I could use coconut oil instead of the butter. I can’t do dairy… Thanks! I used 1/2 raw honey & 1/2 pure maple syrup. I added 1 pinch of pure almond extract. One could use vanilla or lemon. The dough tastes scrumptious! I am waiting to see how they bake up. I did get 16 little drop size balls. I think they will be “popper” size. I will find out! Just pop one into your mouth size, I am thinking!! And I thought I was going to cut back on desserts this week. Ha! 😉 They look great. I just adore the simplicity. Are you certain about your measurements? I doubled the recipe & barely got 6 cookies. I did not use a food processor however. Would that have made the difference?? Regardless, the cookies were very tasty!! Yep–measurements are correct. When I say “bite-sized” cookies, I mean bite-sized cookies 🙂 The pictures just make them look large. The food processor wouldn’t make a difference. I’m glad you enjoyed these! I just made these and love the flavor but I, too, was wondering about the size. I was thinking your mouth must be WAY smaller than mine. haha! I was glad to find someone else comment on that. I found them a little dry so I’m going to try them with a little more butter or add some coconut oil as well. But I’m definitely trying again. I doubled the recipe and also barely squeezed out 12 cookies. I used a food processor and substituted 1 of the tablespoons of butter for coconut oil. I haven’t tried it with coconut oil before–I can’t promise that the recipe will work because butter is about 15-20% water. I hope the coconut oil works for you! I made them with coconut oil because I’m following the AIP. They are delicious. Thank you! I tried it out with coconut oil and honey and it didn’t taste that good. Hi Lauren – thank you for this recipe. I will be trying it as soon as I’m done with my P2 hCG round in a couple weeks! Can’t wait!! Although, I may make them for my son, now that I think about it. He too has gone thru hell over the last 12 months with SIBO which shares the same symptoms as colitis and chrones. everyone thought he was dying because he lost so much weight!! however, what I wanted to tell you is that he has found totally freaking AWESOME wellness doctors that CAN HELP YOU BEAT THIS! My son is at least 90% whole again. He’s made incredible progress just in the last 3 month’s with Dr. Snow. If you want info or would like to email my son about info, please let me know. I wish everyone that suffers from this to get better…..and now I know it’s possible with the RIGHT guidance. Hi Belenda! I’m so glad to hear that you son has made so much progress with his health! I would love any information about the doctor he sees–I am always looking for new resources! I would be very interested in Dr. Snow’s info. I have a 6 year old with Crohn’s. Thanks! could you please let us know the info to Dr. Snow? I’m very interested in this as well. I am eliminating eggs this week to check for allergies. I am so happy you posted this I could cry. I also have a ton of coconut flour from making coconut milk. Thank you from the bottom of my butter loving heart. I’m so glad this recipe gives you a cookie option! Enjoy! Wow! These look yummy! Can’t wait to try them! Oh thank you! I am super pregnant and hungry, so easy and healthy cookies have just made my day!